The leading independent specialist for windscreen replacement and windscreen repair based in Dumfries and serving all of the Dumfries area. National Windscreens Dumfries fitting centre provides windscreen replacement and windscreen repair services to businesses and individuals throughout Dumfries and the Dumfries area. Dumfries lies in one of the three major geographical areas of Scotland in the Southern Uplands. 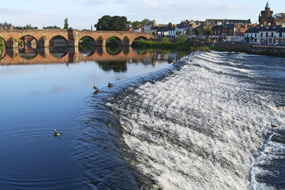 The river Nith runs through Dumfries and toward the Solway Firth. The A75 and A74 provide access to the town, and the A74 also connects Dumfries with the M6 and the south towards Carlisle. Dumfries was the hometown of the world famous poet, Robert Burns, and he is now buried in St. Michael’s churchyard in the Burns Mausoleum. The beautiful landscape around Dumfries attracts many tourists to the area. The Dumfries windscreen fitting centre and its mobile vehicle glass technicians service the needs of Dumfries and the surrounding area including Castle Douglas, Gretna, Moffat and Lockerbie. With 108 fitting centres and over 800 mobile technicians, National Windscreens operates the UK's largest windscreen repair and windscreen replacement network. The company provides low cost, high quality windscreen replacement and windscreen repair from its Dumfries fitting centre 24 hours a day, 7 days a week, 365 days a year. Repair and replacement of all types of vehicle glass including windscreens, rear windows and side windows is undertaken throughout Dumfries and all of the Dumfries area.